Barnett Fine Art presents a holiday gift guide that caters to a wide array of interests. If you are looking for the final gift to present to a loved one who is very particular about their fine art collection, Barnett Fine Art has a large and varied selection that is sure to please even the most discerning of fine art collectors. From art deco to psychedelic to cubist to surreal, Barnett Fine Art has a substantial selection of curated offerings, so you will be sure to find the perfect holiday gift. Alexandra Nechita is an extraordinary individual who produces extraordinary artwork. She has been recognized worldwide as the first child prodigy in the visual arts. 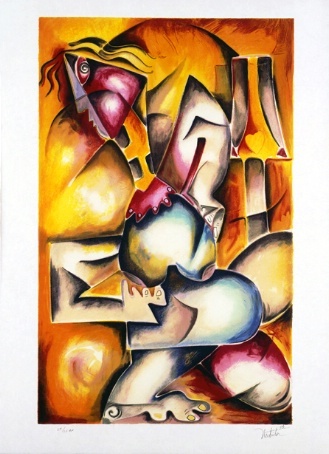 By the time she was ten years old, Nechita was producing impressive works that were reminiscent of Picasso’s style of Cubism and were highly sought after by a worldwide audience who dubbed her “The Petit Picasso”. Nechita’s “Boxed Sunshine” is a prime example of the artist’s firm grasp of Cubism and bright expressiveness contained within a single image. Erte is most commonly known as the “Father of Art Deco”. If you have a family member who loves this graceful yet extravagant art movement, then a piece from Erte would be a thrilling holiday gift. Just as functional as it is elegant, Erte’s “Narcisissm” is a beautifully-crafted wall mirror. 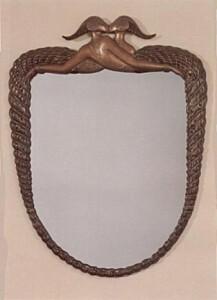 This wall sculpture depicts a mermaid kissing her own reflection in an act of narcissism while the observer can contemplate their own beauty and narcissism by gazing upon their own reflection. A clever piece, this wall mirror created by the Father of Art Deco himself makes a great addition to any serious Art Deco collection. A local New Orleans artist, Joan Hooper Feibleman creates beautiful artwork reminiscent of Georgia O’Keefe. 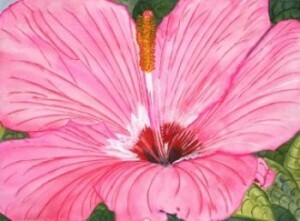 Her bright, expressive macro paintings of flowers are whimsical yet true to life. Feibleman’s “Beauty is in the Eye of the Beholder” is a wonderful water color painting to give to a loved one during the holidays. Its ethereal brightness livens up any room where it is displayed. 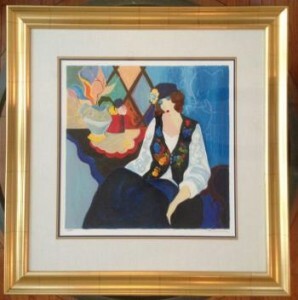 Joan Hooper Feibelman is a new artist in the Barnett Fine Art collection. Keep an eye on the Barnett Fine Art blog for an upcoming post all about her wonderful work. 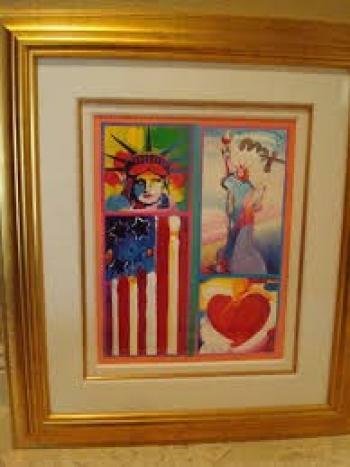 Peter Max was an instrumental artist during the counter-culture and psychedelic movements of the 1960s and 1970s in America. The signature shapes and color pallets of his illustrations and graphic designs typify the American counter-culture revolution. 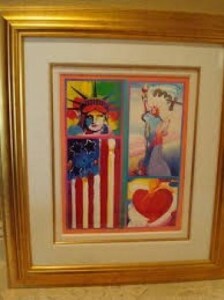 Max’s “Two Liberties, Flag and Heart” embodies both the spirit of the psychedelic movement and American pride. Itzchack Tarkay was an Israeli artist and concentration camp survivor. Influencing a new generation of figurative artists, Tarkay gets his cues from French Impressionism and Post-Impressionism. His graceful, figurative themes are sometimes described as “Café Society”. Although his work is highly reminiscent of Matisse, Tarkay uses his own unique style to create wistful images of elegant women that draw the viewer into a dream world. Tarkay’s “Waiting 2 1991” depicts a placid woman composed of elegant lines gracefully sitting in a chair and waiting. This beautiful work deftly captures the ennui of waiting and makes a fitting present for the elegant woman in your life who is waiting for Christmas. 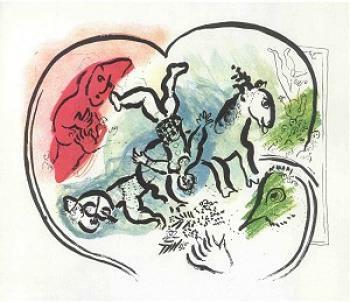 Marc Chagall was a prolific Jewish and Russian-French early modernist who worked in several different artistic styles and mediums. He described his work as being “not the dream of one but of all humanity”. Chagall experienced the “golden age” of the modernist movement in Paris, where he was influenced by cubism, symbolism, fauvism, and surrealism. His dreamlike “The Heart of the Circus” captures the joy of the human spirit with delightful colors and ecstatic lines. This signed lithograph makes a valuable addition to the fine art collection of someone close to your heart. This entry was posted on Friday, December 18th, 2015	at 10:00 am	and is filed under Art For Your Collection	. Both comments and pings are currently closed.